Now, that is interesting and before you think of this news as just another rumor around Dengue and Chikungunya treatment, know that scientists have already carried out the study at New Delhi’s International Centre for Genetic Engineering (ICGEB) on mice. The good news it, the medicine was effective on mice in the laboratory study. We all know that Chikungunya and Dengue have been creating a havoc in terms of making people sick, causing bone ache and deaths citing unavailability of definite treatment. The statistics show that over 1.5 lac patients were affected by dengue of which 250 succumbed to the illness while over 60K were diagnosed with chikungunya. Hence, this news can be a positive step in using traditional medicine system in India. The common people living in Tamilnadu and Kerala have tried the formulation of this medicine and it has seemed effective on them. Even the government of Tamilnadu and Kerala have given their nod or approval for using it when there is an outbreak of dengue or chikungunya. But, as per the lead author of these scientific papers, there is no full proof evidence as questions on whether the medicines work and if yes, how, remain unanswered till date. The said medicine called Amukkara Churanam consisted of Ashwagandha as its main ingredient. This ingredient did work well in preventing the chikungunya virus from entering the blood barrier and affecting the joints. Its test on mice also showed that the virus was not able to cross the blood barrier and affect the joints. Chikungunya is also known to cause brain inflammation or altered mental functions. This Siddha medicine worked well in preventing these neurological symptoms that has been cited as a major cause of patients being admitted to the ICU as well as deaths. It also works in avoiding the post disease arthritis issues. The scientist have studied the second medicine known as Nilavembu Kudineer in vivo already but are in the process to try it on mice. It has also shown the ability to stop the dengue virus from multiplying and restricting the chikungunya virus entry. The main ingredient of this formulation is Andrographics. It does the work of binding the receptors that the virus bind with. As per Dr Sunil, group lead at ICGEB, this ingredient can be put to use as prophylactic treatment for prevention of chikungunya and dengue. The lab testing for dengue virus on mice is yet to be done while both these studies have found a place in the Journal of Evidence Based Alternative Medicine besides Journal of Viral Diseases that are funded by the ministry of AYUSH for Research in Siddha. 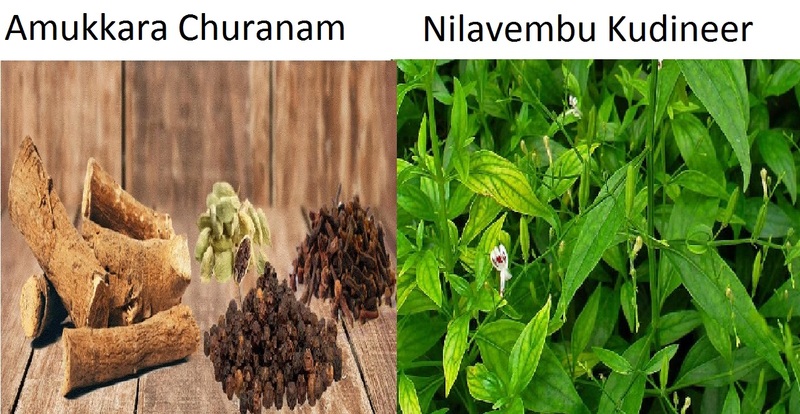 This entry was posted in Healthcare and tagged Amukkara Churanam, Ayurvedagram, Nilavembu Kudineer, south Indian medicine for chickengunya, south Indian medicine for dengue on August 20, 2018 by admin.